SRINAGAR, India, Jul 22 2013 (IPS) - Twenty-three-year-old Haleema (not her real name) was not the first female patient at Srinagar’s Chest Diseases Hospital in the Indian state of Kashmir to try to run away. While undergoing treatment in the isolation ward reserved for tuberculosis patients, she hatched a plan with her brother to dodge the watchful eyes of the officer in charge, Ali Mohammad, and make a quick escape. “I don’t have TB,” a distraught Haleema told IPS from the bed where, for the time being, she is reluctantly continuing her treatment. Her doctors say she is suffering from all the telltale TB symptoms, including a bad cough that has lasted for over two weeks, evening temperature rises, blood in her sputum and loss of weight and appetite. Worried that the infection could lead to fibrosis (a thickening of the lung tissues) if left untreated, doctors are administering daily doses of isonicotinylhydrazine (INH), rifampin, ethambutol and pyrazinamide, which they hope to continue for six months. Far from being grateful for the care she is receiving at the state-run facility, the young woman insists that the hospital staff are putting her future “at risk” by forcing her to stay put. Haleema’s desperate escape attempt is not an isolated case, but rather a trend in this region of 12 million people, where misconceptions about TB are thwarting doctors’ attempts to stamp out the disease. Although government health centres are technically “free”, scores of patients end up footing the bill for related services such as X-rays and other laboratory tests. For some, like 37-year-old Gulzar Ahmad (not his real name), this effectively makes treatment cost prohibitive. Hailing from the southern Shopian District, Ahmad, a truck driver, says he has not been able to earn “a single penny” since starting treatment two months ago. He is worried about the toll this is taking on his family: his 14-year-old son regularly misses school in order to stay home and help his mother in the fields. A majority of the 440 interviewees reported a loss of income as a result of TB. Thus many patients end up avoiding hospitals and health centres, or stopping their treatment halfway through. Medical professionals throughout the state told IPS that many people believe TB to be an “incurable” condition, convinced that whoever gets it is bound to die before spreading the infection to family members. Women often bear the brunt of the stigma attached to TB. According to Mushtaq Ahmad, director of the State Tuberculosis Diagnostic Centre (STDC), misunderstandings about the disease and its impacts pose “a major challenge” to the medical establishment. He says that some TB patients prefer to visit private doctors rather than check into free, government-run health centers, in the hopes of keeping their health status a secret. Experts say incomplete treatment is a serious health hazard for the entire region. 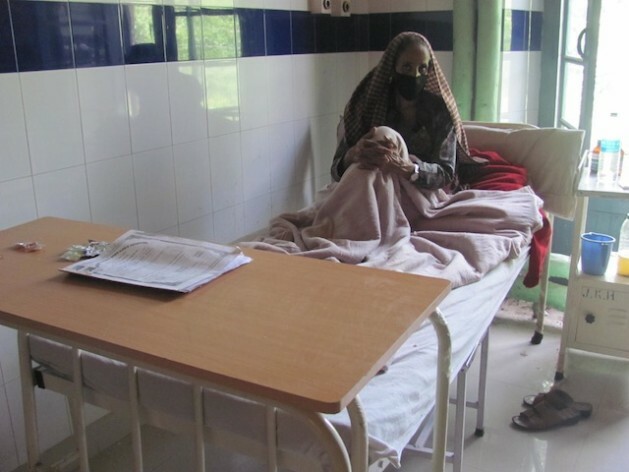 Ghulam Ahmad Wani, Kashmir’s chief tuberculosis officer, told IPS that patients frequently declare themselves infection-free after a month, even though a full course of TB medication typically runs for at least six months. “Though the symptoms may disappear, this does not mean the disease has been cured,” he stressed, adding that, on the contrary, stopping TB treatment prematurely simply makes the disease harder to treat. Patients end up developing multidrug-resistant tuberculosis (MDR-TB), a particularly virulent strain of the disease that refuses to respond to isoniazid and rifampin, the two most potent TB drugs, and a host of related medications. The worst-case scenarios, says Suraiya Farooq, an MD at the Chest Diseases Hospital, include extensively drug-resistant tuberculosis (XDR-TB) and totally drug-resistant tuberculosis (TDR-TB), which are particularly worrisome strains for people living with HIV/AIDS, since the body effectively stops responding to even second-line intravenous drugs, leaving the patient with a severely weakened immune system. The repercussions of this trend are magnified in India, the country with the highest number of TB patients in the world. According to the World Health Organisation (WHO), India accounts for one-fifth of global TB cases, with two million people developing TB annually, of which roughly 870,000 are thought to be infectious cases. It is estimated that 300,000 Indians die of TB every year. Residents of the mountainous state of Jammu and Kashmir, nestled between the Great Himalayas and Pir Panjal mountain range, are highly susceptible to TB, especially those who dwell in traditional mud huts without proper ventilation. Unhygienic and crowded living conditions also encourage transfer of the disease, according to Suraiya. In 2012, Kashmir’s Tuberculosis Cell conducted sputum tests of 50,000 people who complained of TB-like symptoms: 5,800 were diagnosed with TB. In the previous two years, according to officials speaking to IPS under condition of anonymity, more than 15,000 out of roughly 100,000 suspected cases tested positive for TB. The officials refused to divulge the number of deaths resulting from these cases. Most experts agree that a lack of awareness about the disease is the main culprit for the high infection rate and for the number of people who either deny their diagnosis or discontinue their treatment. Quoting figures from her recently published study, Kausar told IPS that 10 percent of women with TB did not know they were living with the condition, while 60 percent of female patients had no knowledge about the disease and how it spreads. According to her research, few patients were aware that TB is a bacterial infection, caused by inhalation of respiratory fluids emitted by an infected person; in fact, one-fourth of the women surveyed attributed the disease to “tension”, stress, domestic strife and “past sins”, while 21 percent of nearly 250 male respondents believed the disease was caused by smoking. Ahmad lamented that Kashmir’s health department had yet to create a comprehensive awareness campaign, though he welcomed recent efforts undertaken through the Revised National TB Control Programme (RNTCP), which is being implemented throughout India as part of a nationwide TB eradication initiative. States are now utilising radio and television stations to advertise that the disease is treatable. “We are also (mobilising) school teachers and preachers from the mosques to help spread the word,” he said. Suraiya says awareness is crucial not only for ending the stigma but also for urging people, especially residents of the Himalayan foothills, to come for regular check-ups or sound the alarm when a family or community member has been coughing continuously for more than a week.